Weddings Costs > How Much Does a Wedding Makeup Artist Cost? How Much Does a Wedding Makeup Artist Cost? A wedding makeup artist will apply makeup to your whole wedding party, including the maid of honor, bridesmaid, and of course — the bride. The cost of a professional makeup artist will depend on his or her experience, the geographical location and the number of people. Professional makeup artists will be to able hold a preview session where they can discuss your options as well as apply the makeup as a trial run to see if it’s something you want. This will give you a good idea what they are going to be able to do for you. A preview can cost $45 to $95 per person, but the costs may go down if you commit and sign a contract. On the day of the wedding, the costs will depend on who’s getting the makeup done. For the bride, an application can cost $45 to $250, while the rest of the bridal party can cost $50 to $100 per person. A big-name artist may charge upwards of $550. The bride will cost more when compared to the rest of the party since the artist will have to spend more time and attention. Big companies, such as MAC, will come over and do your wedding makeup for $200 per person, but in order to do so, it’s said you have to purchase $50 worth of products to take advantage. Woman Getting Married did some research and found the highest price for both the bride’s makeup and hair was $300, while the lowest for this combination was $150. For the makeup only, the average quote was $80. We went ahead and called/looked up a few makeup artists across the United States and came up with the makeup artist quotes below. To protect the artist from being listed without their permission, we just listed the city they were based out of. A makeup artist is going to meet with you prior to the wedding date to make sure both parties know what to expect. If you want to have a sample application, many may charge simply for the makeup, while some do it for free if you sign a contract. It’s best to discuss your options to see what’s included. Artists will typically spend seven to 10 hours on your wedding day, and before the wedding even starts, he or she will be available via e-mail and the phone to prep the big day. On the day of the wedding, they will come to the location of your choice, which is typically a hotel or a separate room at your wedding venue. A professional will bring all of her products, chair, lighting and other necessary equipment needed to apply the makeup correctly. These artists can work with the bride, mother of the bride, the bridesmaids and flower girls. Most artists will require you place 50% down when signing an artist for your wedding. While this 50% is applied toward your final bill, this is money that you’ll have to give up front to make sure they will be there on time. Factor in the travel expenses if the wedding makeup artist has to travel to the venue. They may charge $25 to $75 per hour for the travel time only, or some artists may have a flat fee to travel to nearby cities. If they have to travel more than 25 miles, the costs may go up. If you want the makeup artist to stick around the wedding for touch-ups, hourly rates will apply. The same can be said if you want a different look throughout the day. 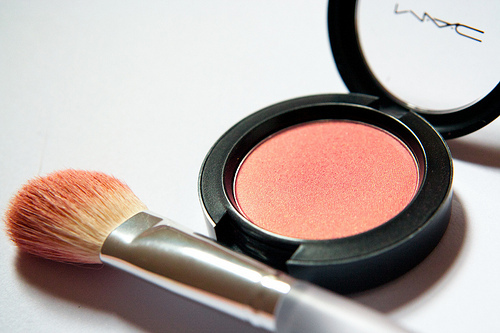 While not necessary, many wedding makeup artists may expect a tip. These tips can range from 10% to 15% of the total bill. Add-ons such as fake lashes could be an additional $10 to $20 per person. For parties larger than seven, a makeup artist may need to bring in an assistant to help him or her with the job, especially if there’s a tight time frame. Browse the Internet ahead of time to find colors and styles you would like to bring to your consultation to give the artist a better idea what you’re looking for. It also doesn’t hurt to bring a picture of your dress to help the artist think of creative looks that blend with your wedding day look. Think about the logistics of your wedding day since hand applied methods could take up to eight hours for a small party while airbrushing could cut the time in almost half. Also, because of this time and materials involved, be realistic on the prices since an artist may have to spend upwards of 12 hours with you, along with the communications back and forth up until the wedding day. Book your artist as early as possible because the good ones may have their reservations booked for as long as year or more. Always look at their book and portfolio to see their work from the past, and always take advantage of the trail run to see if you’re happy with the results. Most artists will offer a discount for larger parties. The more people you have, the more you may be able to save per person. Some artists may be able to do the hair and makeup together, saving on costs. If the artist charges by the hour, make sure your entire party is nearby when the makeup is being applied. That way, when it’s time to switch, there’s no time wasted switching between the two.